This Koeblitzer Mountain Route 3 Reloaded add-on is a continued development of the freeware route Altenburg-Wildau by the Dutch developer Siegfried Derks, aka SAD. In this new version some suggestions coming from users have been implemented to allow more interesting scenarios and to remove some minor bugs. The newest version H/V and semaphore signalling system of the SignalTeam have been implemented as well as the new Ks signals. For the PZB the 500, 1000 and 2000 Hz magnets of virtualRailroads have been used. 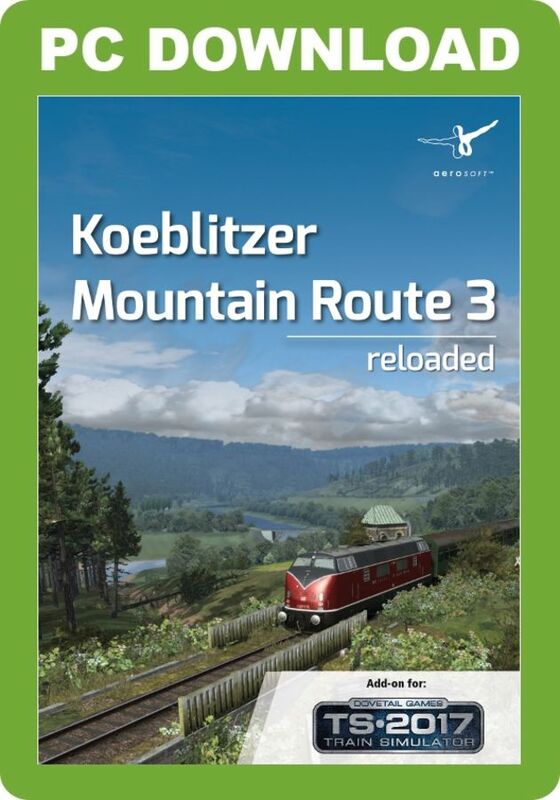 This version of Koeblitzer Mountain Route has some new features and expansions. You will find a high speed track where you can drive with LZB (continuous automatic train running control). The new shunting station Altenburg-Nord gives you additional possibilities for scenarios. Geographically it is situated somewhere in the region of Trier, in the westernmost part of Germany. 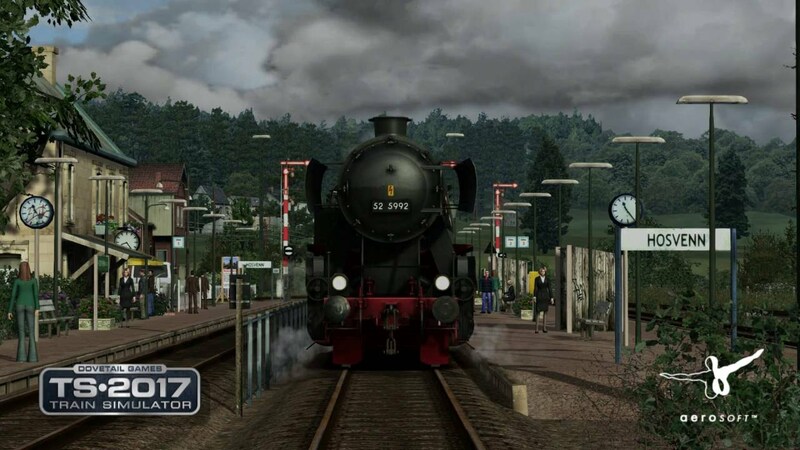 It has taken the developer two years to build this imaginary route which gives the impression of a real-life scenery in the west of Germany. This version of Koeblitzer Mountain Route has its own new path folder, so that for users of previous versions all scenarios and all individual changes that were made to the existing version of Koeblitzer Mountain Route will remain! This add-on is timed in the early years of the 2000s when maintenance of tracks and railways was not a priority. Stopping points and former stations are overgrown, as are the unused tracks which haven't been used for a long time. Modern shelter huts can be seen next to old stations which are no longer in service. Abandoned stop stations have made the way for car traffic and signal boxes have been modelled with broken windows as dispatch and organisation have all been centralized. Everything that reminds the rail fan of the good old times can be seen in this add-on, not only in a melancholic way but also with a wink of the eye. Nature is claiming back its territory. Be enchanted by driving along the 22 km track from Koeblitz to Wildau. Discover the lovingly arranged scenery beside the tracks. Enjoy travelling with high speed on the 20 km ICE track from Bad Rinckenburg to Altenburg. Feel the charm of bygone railway times on one of two heritage lines. Drive along the electrified main line and step up to its challenges: unfenced crossings, gradient and speed changes will need your complete attention. Enjoy the beautiful scenery while comfortably driving on the branch line tracks through the Koeblitzer Mountains or feel the stress while trying to keep the regional express on schedule. Many connecting tracks create possibilities for new and interesting scenarios. The developer Roman Glos put the signals in place and Mathias Gundlach and his team delivered changed and corrected H/V, KS and semaphore signals. The EL signals are from virtualRailroads and the LZB triggers for LZB driving on the high speed track come from from RailTraction. To get closer to reality we implemented train and station announcements in all scenarios and dialogues between train driver and dispatcher and, last but not least, you will find a complete new weather system. The implemented rolling stock is from German Railroads and 3DZug: BR143, BR323 Köf II with different repaints, mint coloured n-coaches with drivable cab car BDnrzf, freight wagon Omm 52 and Bage heritage trains. All of them now have winter textures and an improved sound. The whole track now has a new catenary system. The main stations of Altenburg, Koeblitz and Bad Rinckenburg were equipped with Zp 9 (starting signal) and driving indicator. Some tracks are now equipped with the speed testing system. All stations were modernised, the signalling was completely overhauled and the secondary track speed was adjusted. The shunting yard of Bad Rinckenburg is modernised. There are eight sidings with a maximum length of 400 m. We removed the tunnel from Bad Rinckenburg main station to enlarge the radius of the track. The entry track goes now around the hill. We also changed the signalisation of the shunting yard to give you a wider range of possibilities for creating scenarios. The track layout was changed in connection with the new shunting yard and the changed entrance in the South. Coming from Luxembourg,tracks 5-7 now can be reached; coming from the shunting yard all tracks of the station can be reached. Due to the connection of the ICE track also the other tracks in the North were changed; now tracks 4-7 can be travelled with a maximum speed of 120 km/h. We enlarged the route to the North with about three additional kilometres of tracks. Next to the passing tracks there are five tracks with a maximum length of 350 m. At the north side there is a turnout track of 500 m, on the south side four electrified and one non-electrified sidings for the new diesel filling station. The station has been completely modernised. The tracks in the south in the Wildau/Bad Rinckenburg direction are completly new so you can drive to platforms 2-7 coming from Wildau / Bad Rinckenburg. Platform 7 can be used for scenarios and has a track speed of 30 km/h as in reality. In the south-east there are six sidings. Entry into the power station is now possible from Köblitz main station via platforms 1-4. We removed the limitation to freight traffic to give you more freedom for creating scenarios. The manual switches were replaced with automatic ones. The signalling is via group exit signal with Sh signals. This station has been completely modernised too; you will recognize it by the elevators and escalators. The track layout to the North was changed. There is a new siding available which can be used as a rebound for passenger trains. The track can be used coming from tracks 2 and 3. This now features new tunnels, LZB, new tracks and a new catenary system. The track starts at Altenburg main station on platforms 6 and 7. Shortly before Altenburg Bach the tracks are diverted from the main track and you drive over valleys and through a tunnel, the first one of many on this 20 km long track. It ends at the old bridge. The ICE track has superelevation and the maximum speed is 200 km/h. Due to the tight space the ramp does not reach the necessary height for the catenary so signals El 3 and El 4 were needed here. The radiuses of the points are enlarged (190 m). Exit signals and Ne 5 stopping board in the Koeblitz direction were changed right before the pedestrian crossing. Also the incorrect switches were fixed. The track harp was changed and all switches are now automatic switches. Next to the shed there is a coal depot and a water crane for steam locos. New working entry and intermediate signals. In the Wildau direction level crossings have been renewed with more realistic speed limits of 10 km/h without the need for a full stop of the train. The wrong track speeds have been corrected. The speed limit on platform 4 is removed and it can now be travelled at 80 km/h in route direction. Also platform 3 can now be travelled at 60 km/h and the track harp has been neutralised. Close to Koebler Wald, the little village of Rochustal is now connected to the route and has its own little station. The final station of the heritage railway. Next to the station, this idyllic place also got a loco shed. The hectometer (milepost) signs have been completely renewed. The new signs are more readable even when driving with higher speeds. They were kindly provided by Holzlaender. The placement of the signs was adapted to the directive RiLi 883 by Deutsche Bahn. The whole track has a new catenary system. A part of it was kindly provided by virtualTracks. Of course there are also optical improvements. There are new telephone lines to Hosvenn, overground lighting wires with wooden poles and old Prussian lanterns and some other improvements along the museum track. 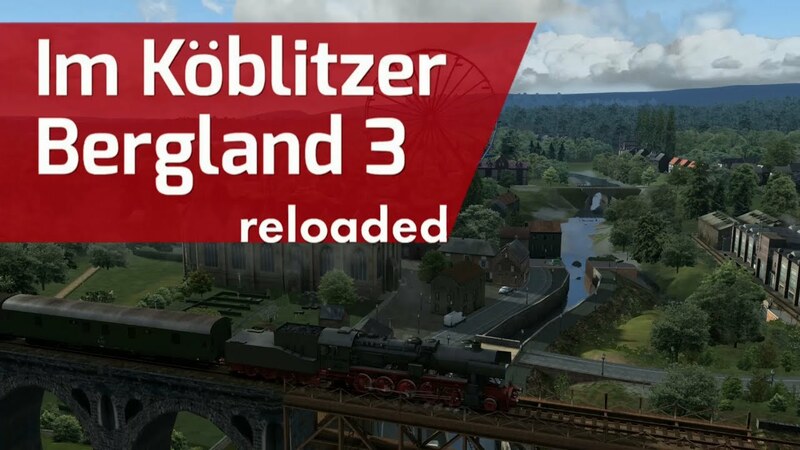 The new version 'Koeblitzer Mountain Route 3 Reloaded' will appear as a complete new route in Train Simulator.The old version ‘Koeblitzer Mountain Route 3’ will be still avalable and usable. The developers choose this solution to make sure you can still drive the scenarios of the old version. The hugely updated iteration of the fictional 95km Koeblitzer Mountain Route in Germany brings many new features and updates, including new signalling, totally updated rolling stock, new catenary system, modernised stations, improved lighting, updated track and a new weather system. Also included are 10 Quick Drive scenarios with AI and eight new standard scenarios complete with train and station announcements.